Tidy-Up trash receptacles are a convenient way to help keep the dog park neat and clean for guests, for both two and four legged variety. With a pet-friendly theme that also serves well as a welcome sign for community dog parks—the fun, laser cut graphic details of paw prints and dog bone complement the perforated steel construction. Units have a 32 gallon capacity and are finished in a UV-stabilized, corrosion-resistant thermoplastic coating, liners are sold separately. Crafted to best suit facility litter management demands, an array of lid styles, liners or mounting kits upgrade options are available. 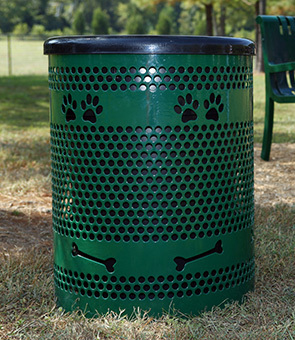 Tidy-Up trash receptacles are a perfect accompaniment for BarkPark® agility courses and other dog amenities like Chow Hound Table, Sit and Stay Bench or Pooch Perch Benches. lid and/or liner are sold separately.